Stop me if you've heard this one before: "Cleveland man bitterly disappointed by view at football game." 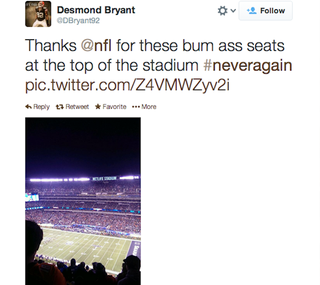 Browns defensive lineman Desmond Bryant got some tickets to the Super Bowl from the NFL and was apparently hoping for a better view. Maybe next year. He tweeted his displeasure and quickly deleted it.